Hats off to Jacques. Thirty three years on and the renowned Cork City restaurant, the oldest in town, is still setting the pace. The Barry sisters, Eithne and Jacque, who started it all off, could be forgiven for sitting back and taking it easy. Not a bit of it. The award winning establishment, now with a small plates/tapas area recently added, continues to surprise. “Every seven years!” said Eithne when we were in the other night. Every night really. I had started to look around for specials when I realised that the menu is really all specials. “We had a different menu last night. Depends on the market.” Now that takes some commitment. And the commitment is extended to local producers, most of them named on the back of the menu. Some are well known, such as Breslin Butchers in the English Market, Gubbeen cured meats and Kanturk’s Jack McCarthy. Some are so well known, only the first names are used e.g. cheesemakers Giana and Jane. And the fish? “Well,” they say, “just look at the size of the Cork coast”. And the sisters are delighted too to support the craft beer revolution which is quite strong locally with new breweries popping up all over the county. 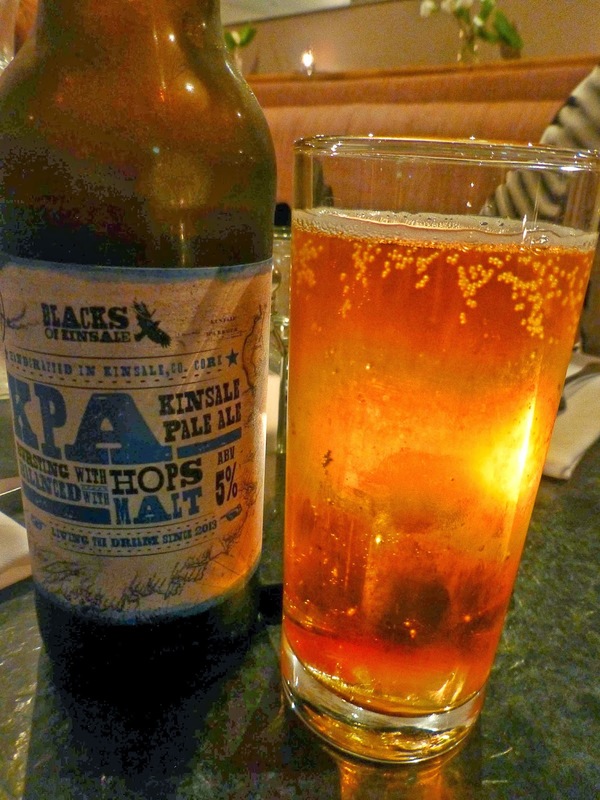 My choice in Jacques was the Kinsale Pale Ale, in its new and larger (50cl) bottle. One of the best ales I've come across (and I was in to Bradley’s the following day for more). Now, for the food. Let’s take a look at the starters: Soup of the Day - Fresh Mussels with Chorizo Tomato and Garlic - Crab and Apple salad - Salad of Blue Cheese and poached pear - Smoked Ummera Chicken. All tempting but I went for the Lambs Kidneys Dijon, with mustard, gherkins, apple and cream. The super sauce was one of the elements that made this a great success. And CL was blissfully happy with her flavour packed plate of Pigeon breast, white onion and thyme and Jack McCarthy’s Black Pudding. We stayed on the game as we choose our mains. Mine was the Haunch of Venison on celeriac puree with some handsome robust kale, confit of shallot and red wine jus. A simply spectacular combination. so well executed. 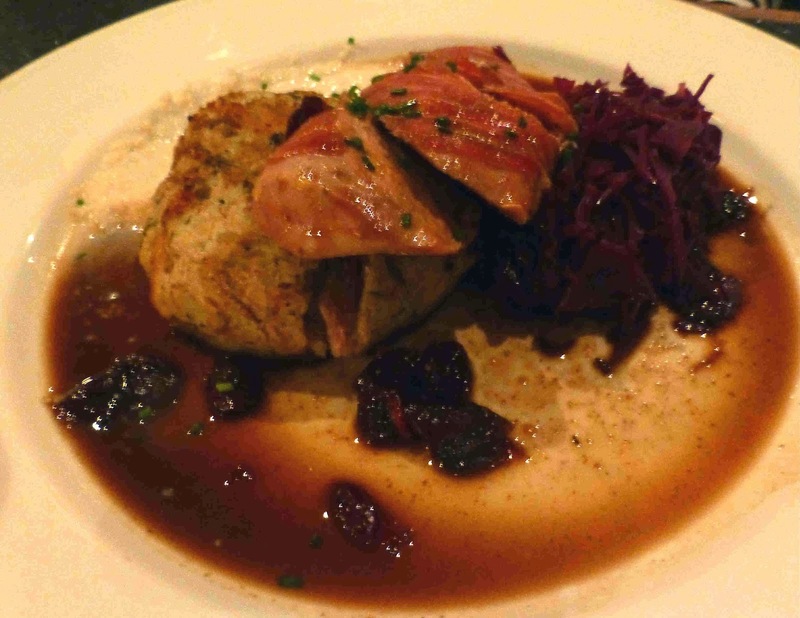 And similar sentiments at the other side of the table as CL made her merry way through the Roast Pheasant, wrapped in pancetta, confit leg in potato cake, red cabbage and bread sauce. A terrific choice too of main courses. Also on the list were: Scallops - Fresh Organic Sea Trout (with Goatsbridge Caviar) - Slow Braised beef short ribs - rib eye steaks - and a 7 vegetable Tagine. 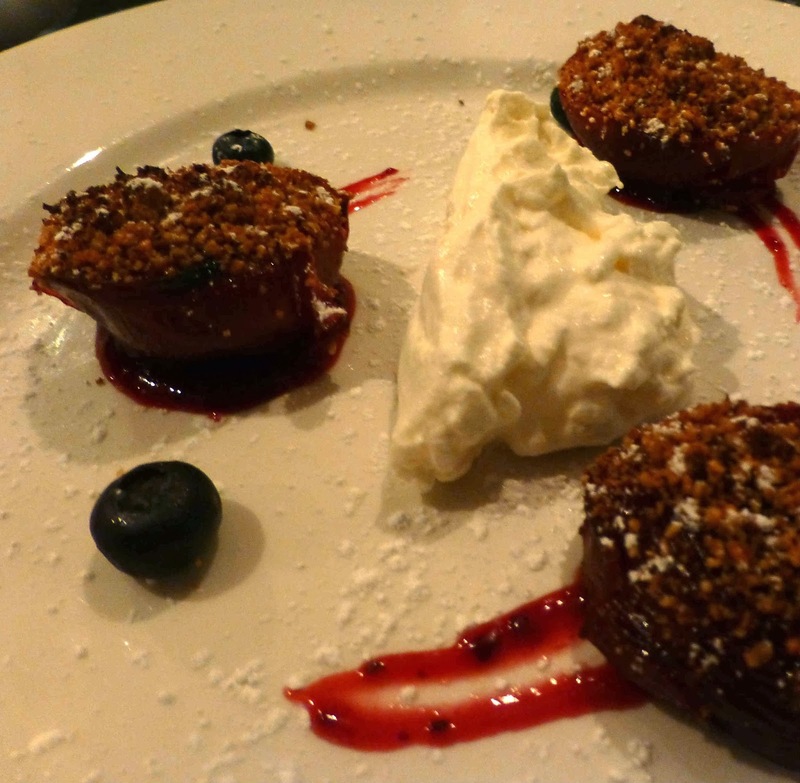 Seven temptations too in the dessert menu but, running out of space, we picked one to share and it was the gorgeous Plum and Walnut Crumble, well cooked and presented, underlining the immaculate attention to detail that prevails in this pleasant place. Here's to the next thirty three! 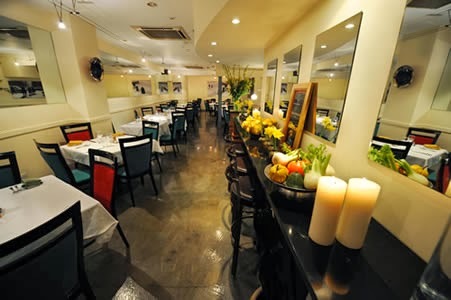 Jacques Restaurant is located at the heart of Cork City near the G.P.O. and is open Monday 10am - 4pm and Tuesday - Saturday 10am - 10pm. Lunch from 12pm - 4pm, side plates and tapas from 5pm to 10pm and the evening dinner menu is available between 6pm and 10pm.